So… how is the New Year’s diet going? Wait wait wait. Please don’t click off just yet. While many of us woke up bright-eyed and bushy-tailed on December 31st ready to start that brand new fitness regiment on the 1st, it’s safe to say that more than a few of us have slowly drifted back into old habits pretty fast by now. It’s normal. January is cold, wet and everyone’s broke, so trying to add a complete lifestyle change on top of that is a tall order. The solution? Small changes. Maybe instead of going for that 10km jog every morning, try a short run every other day. Don’t feel bad if you can’t get to the gym every day and don’t feel bad about breaking that new diet occasionally. When it comes to making healthier food choices, there are plenty of little changes you can make to your favourite dishes and snacks to reduce salt, fat and overall calories without getting rid of the flavour. And that’s what we’re going to cover today! Trying to get more vegetables into your diet is a classic resolution for the new year, but it can feel like a struggle sometimes, especially when the standard fare of boiled peas, broccoli and carrots can taste pretty bland after a while. The trick is changing the way you prepare your veg. Just boiling them adds no flavour and, when you overdo it, can give them a nasty, mushy texture. 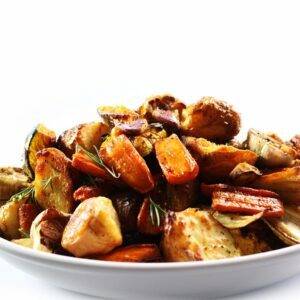 One of the simplest and nicest ways to prepare your vegetable side dish is by roasting them. You’d be surprised all the flavour you can get from such a simple change. All you need to do is chop up your choice of vegetables into chunks and roast them at 200 degrees Celsius with a drizzle of olive oil and a few herbs. Easy! Remember to try and eat the rainbow (no we aren’t crazy). Just try and get as many colourful fruits and vegetables into your diet as you can. It one of the easiest ways to make sure you’re getting your proper 5-a-day. We’ve all heard about the importance of staying hydrated, yet so many of us still aren’t drinking the recommended amount of water: 6-8 glasses a day. Most of the time we just forget, and even though there are plenty of apps that can send reminders about drinking water, we sometimes ignore them if we’re busy. The solution to this is convenience. We’re way more likely to drink water if we always have it to hand, so for this new year, why not carry a water bottle around with you wherever you go? You’ll be surprised how often you’ll find yourself sipping water if it’s always right next to you. Plus, it means you’ll be less likely to reach for something full of caffeine or sugar. If you aren’t a fan of water’s taste, you can always infuse it with fruit. Fill a large jug with water and sliced fruit and refrigerate it overnight to add some natural sweetness. When you’re trudging home in the dark, nothing is better at warming up cold hands than a nice bowl of soup. With a number of healthy options to choose from, why not take a look at some of our favourite recipes! One of the best things about soup is that you can make it in bulk! If you’ve made too much or don’t want to think about making dinner for the next few days, most soups can keep up to five days in the fridge or three weeks in the freezer if stored in a good container. If there’s one thing that many of us succumb to even when we’re trying to stay healthy, it’s snacking. It’s completely normal and a hard habit to break, especially when you’re bored, hungry, or just happen to come across an open packet in the cupboard. Luckily, we’re not going to tell you to stop snacking all together as that might be a bit too much of an ask. Instead, we’ve got some healthier alternatives that you shouldn’t feel bad about indulging in once and a while. Popcorn: This classic cinema snack can also be a great substitute for crisps. Be careful though. Plenty of store-bought popcorn has a high sugar content, so if you’re a regular snacker, make sure to pick up a healthier vision or pop your own and add only a little sugar or butter. Frozen Yoghurt: Big ice cream lover? While it’s a cold, tasty treat, it’s also full of fat and sugar. Fret not. Frozen yoghurt can make a great alternative, plus you can make it yourself at home. Popping plain yoghurt with some fruit mixed in the freezer for a few hours makes the perfect substitute for more sugary options. Cereal: You don’t just have to have it for breakfast. If you’re feeling hungry, a bowl of low-sugar cereal can fill a hole, especially if it’s full of fibre. Porridge makes a great snack as you can top it with basically anything you like! Are you ready to take on the rest of the new year? Maybe it’s time for a new kitchen for the new year! Whatever kind of kitchen style you’re interested in, we can help you find everything you’re looking for. Make sure to check out our designs page for inspiration or have a read through the rest of our blog! We’re here with helpful insights to make your kitchen the most dazzling room in your home. Make sure to pop over to Roman Kitchens and let us design your dream kitchen for the new year!